Frequent scratching, licking and chewing are easily recognized signs of allergies in dogs. But did you know there’s another common allergy sign that you may be overlooking? It’s a recurring ear problem, or problems. How are allergies and ear problems linked? In dogs, the signs and symptoms produced by environmental and food allergies are different than those of people. People with allergies often experience itchy and watery eyes, runny or stuffy nose, sneezing, congested ears, and itchy sinuses, throat or ears. Dogs are more likely to develop intensely itchy skin and red, irritated skin on their feet, belly, head and ears. When the skin lining the ear canal becomes inflamed, it becomes an ideal incubator for bacteria and yeast. Ears, like so many other parts of the body, normally have a few bacteria and yeast cells present. Inflammation and irritation of the ear canal triggers excess wax production that, when combined with a warmer-than-normal environment (due to skin inflammation), provides an optimal environment for overgrowth of yeast and bacteria. These microorganisms cause substantial itchiness and more inflammation, which leads to an itch-scratch cycle that favors self-trauma. 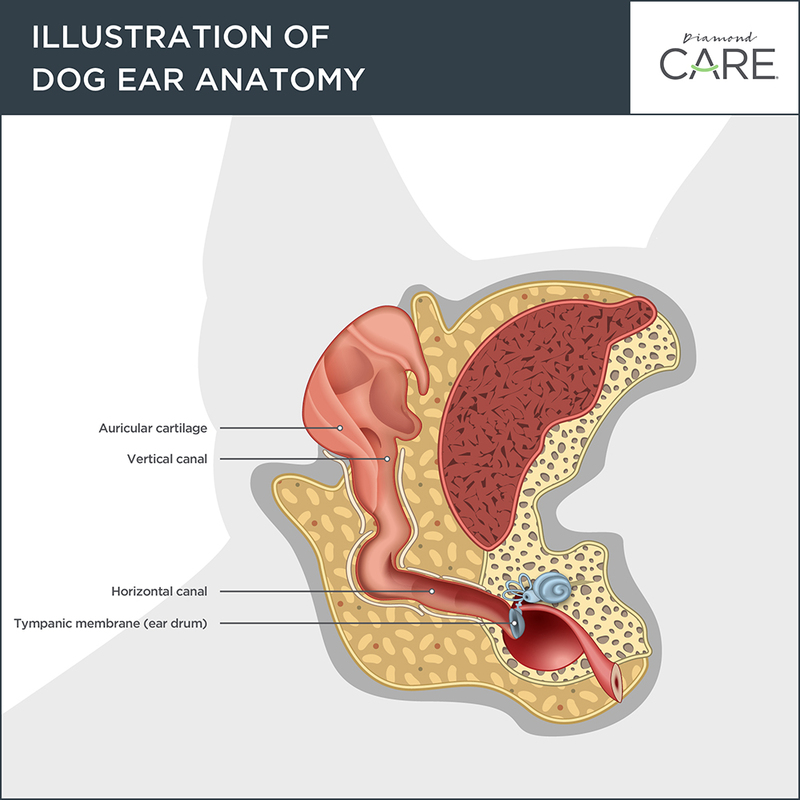 In addition, the canine ear canal is L-shaped, meaning that it has both vertical and horizontal segments. Moisture, ear wax, sloughed skin cells and other debris can become trapped, which further contributes to yeast and bacteria overgrowth. What should you do if you suspect an ear problem? Because so many factors can cause ear inflammation and/or infection, it’s extremely important that your veterinarian evaluate your dog’s ears and any debris or discharge that may be present. Your veterinarian will use an otoscope with a magnifying lens and ear cone — similar to one that may be found in your doctor’s office — to examine the ear canals and ear drums. A sample of ear debris will typically be examined in-clinic using a microscope to check for bacteria, yeast and parasites. To help your veterinarian make an accurate diagnosis, do not clean your dog’s ears before your appointment. The other reason to not clean your dog’s ears ahead of time? An ear drum could already be ruptured and may need to be treated differently from an intact ear drum. Other diagnostics may be recommended if your veterinarian feels they would be appropriate to diagnose an underactive thyroid. Once your veterinarian has examined your dog’s ears and has the results of the in-clinic ear cytology, a treatment plan will be recommended. Treatment often includes a professional ear cleaning or flushing and an appropriate ear medication that is placed in the ear canal. Additional treatments may be needed to address the underlying cause and severity of your dog’s ear problems. Ear inflammation and infections are painful conditions for dogs, just as they are for people. If you suspect an issue with one or both of your dog’s ears, be sure to talk with your veterinarian. And please consult your veterinarian before applying any treatment to your dog’s ears.